This one is it... the last one of the year... Whew. 2016 hasn't been the best year - & I think a lot of people can say that. A few of you have had wonderful years... & that's the way it works - some times a year is the worst year for one person & yet the best year for someone else. & then the next year, visa versa. Life is a funny thing. So individual. I for one am glad to see 2016 go....but am so glad to have had so much to be thankful for ... even in a year I call "not good" I went well over my One Thousand Gifts. Perspective is key, is it not? Striving to look for the good, even on the worst day. I made it a goal for every day to have at LEAST 2 things - strived for 3 things to be thankful for. & some days, I was blessed with so many things to be grateful for. So yes, I'm going to continue Thankful Thursdays & I'll start my count back to ZERO for 2017 & strive for ANOTHER Thousand Gifts.... love for you to join in with me. We used to do a Gratitude Jar in our house. Keep a jar on the table with stripes of paper & when something good happened, we'd write it down & throw it in - & then on New Years Eve, we'd empty the jar & read through the good things of the year. It was easy to forget to write things down - or think Ricky wrote it down when he thought I wrote it down... we lost a lot of good things doing it that way. So on New Years Eve, I can pull up all my Thankful Thursday posts & look back & see how blessed I was in 2016... & find it wasn't a bad year after all. 1095 / A Warm Christmas Eve. Last year on Christmas Eve, it was warm. I can remember being out with Ricky for his birthday & not needing any jackets. Same this year. I wouldn't mind this trend happening every year. Though I do remember a Christmas Eve we all nearly got snowed in - it was the twins first Christmas. UGH - anything can happen weather wise around here apparently on December 24th. 1096 / My love's birthday. So grateful for him & getting to see him celebrate another year of life. 1097 / Christmas morning. There's just something fun about waking up on Christmas morning. No matter what your age is. 1098 / All the fun gifts! I have been so blessed with some fun goodies. Cant wait to break in those running shoes! & I adore that THANKFUL shirt my sister in law got me when I gushed over hers at Thanksgiving. & I told my mom that that set of gel pens is speaking to my office supply nerd heart. 1099 / Church on Christmas morning. It only happens every 8 years (leap year happens - so could technically make it once every 9 years)... I really loved Christmas being on Sunday. 1100 / Day off after Christmas. I usually have to work the day after Christmas so loved loved LOVED having off the day after with Christmas being on a weekend. 1101 / Time with the 'Baby'. Yes, our youngest is 28 years old - always the baby. We got to spend the day after Christmas with her & her boyfriend. & we had the best time. We played some games & just hung out & talked & then went out for dinner. It was just good to visit with her. 1102 / Precious gift. 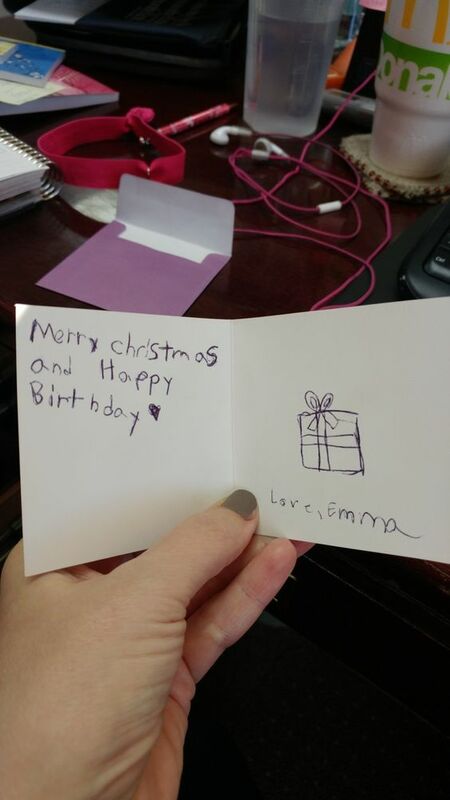 My coworker has a daughter that usually comes in the office during Christmas. I connect with kids. I get them on that child like princess level. I'm on that level myself. The daughter didnt need to come to work this year with Christmas Eve being on a weekend so I didnt see her this year. But my coworker brought me in a gift from her. She said her daughter saw it in a store & said, "Miss Rebecca needs this".... oh mercy - be still my heart. How precious is that? & look at the gift... she TOTALLY does get me. Disney princess notepads? YES PLEASE!!!! 1103 / A fresh start ahead!!!! ... the new year is always a good time to get ready for fresh starts. I always love that. & of course, I can't end my list for the year & not be thankful for the mercy & grace Jesus has given me to make it through the year. I am so blessed. Always. Every Day. I am glad that you found so many things to be Thankful for each year. Perhaps it's not one single "large" thing that made this year a good one but all the little things that make life just a little bit better. Personally I have a hard time with "good byes", so saying good bye to 2016 will be a little harder for me as is each passing year. What a wonderful list. Love those Princess notes and Harvey is so cute in front of the tree. Hoping to make it back later to join in with my list. Thank you for doing Thankful Thursday. I so appreciate it. We both had about the same thought concerning the year. I'm adding one more thing to your list...Harvey Dent didn't eat the tree or the presents! I'm thankful for having a couple of days to get some stuff done--not enough time--but thankful for what little I got! It's nice to get everything cleaned out and onto a fresh start. We have a gratitude jar too but you're right, we so often forget to put things in there. I like that you do this on a regular basis! I love your thankful, happy heart, Rebecca Jo! You're so uplifting! Too sweet about your co-worker's daughter thinking of you! So much to be thankful for! Yes, yes, yes to what you said on perspective! We have a gratitude jar in our house too, but definitely don't use it often enough. 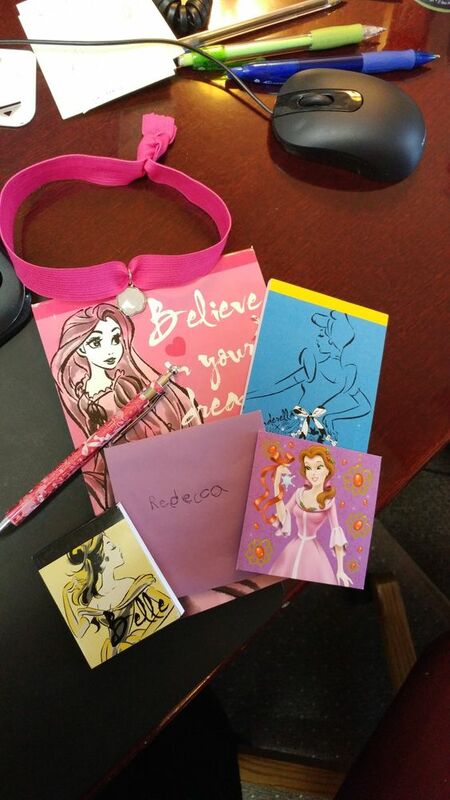 Such a thoughtful and perfect gift from your co-worker's daughter! I linked in for my thankful post today! Thanks for giving us Thankful Thursdays, Rebecca Jo!! I'm thankful for YOU and all of my blogging friends. i love the idea of a gratitude jar but i think i'd forget to write things down as well, so i love that you do these posts. pretty new running shoes!! 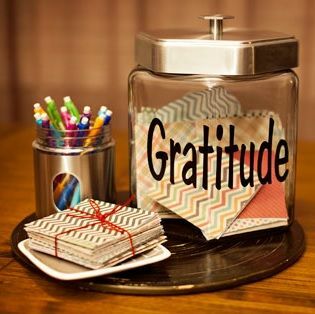 Love the gratitude jar and your sweet, thankful heart! Definitely all of these are things to be thankful for. I can't believe 2016 is coming to an end and Christmas flew by in an instant. I hope you have an amazing weekend!